Ben Schachter, associate professor of fine arts at Saint Vincent College, is currently participating in two simultaneous international exhibitions. 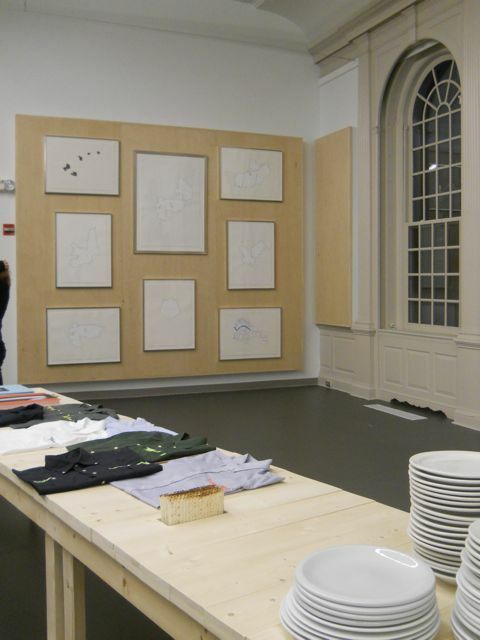 The first exhibition, “This Token Partnership: The Materiality of a Jewish Spatial Practice,” is being shown at the Yale University Institute for Sacred Music from October 10 to December 14. This exhibit is in conjunction with “It’s a Thin Line: The Eruv and the Jewish Community in New York and Beyond,” at the Yeshiva University Museum in New York. It will open on October 28 and will be shown through June 30. Both exhibits focus on historical and contemporary reflections on the eruv. The Yale exhibit, curated by Margaret Olin, includes an international roster of artists including Shirin Nishat, Sophie Calle and Mel Alexenberg. A series of lectures is scheduled to accompany the show. The YU Museum exhibit, curated by Zachary Paul Levine, brings together maps and memorabilia from their collection and contemporary art installations that reflect upon the subject including New York-based artists Elliott Malkin, Yona Verwer and Justin Stewart. Mr. Schachter is displaying “The Residents of Chelm Visit the Yeshiva University Museum” which continues themes he began at the Mattress Factory several years ago. Mr. Schachter’s research brings together Jewish Law and contemporary art. He finds many similarities between the way rules are applied in both realms. These overlooked correspondences inform both his artwork and writing. His work contributes to the growing field of contemporary Jewish Art as seen by the above exhibitions.